Under the rule of Aztecs, surfaced evidence supports the existence of a postal system consisting of a network of messengers. Despite the 1521 conquest by the Spanish, the system continued to operate but in the 1580s, it was decentralised to the members of the nobility. The most important path of communication was that between Mexico City and Veracruz. Improvements were observed from 1742 with the expansion of the postal services between Mexico City and Oaxaca (1745) and the monthly service to Guatemala (1748). In 1765, the Spanish authorities bought back the rights to postal services from the nobility. With the British and French settling in North America, they established a packet service to Veracruz in the early 1820s. For example, British postal agencies operated at Veracruz from 1825 to 1874 and at Tampico from 1840 to 1876. These operated until 1914, while the French service ended in 1835, but restored in 1862 and continued until 1939. 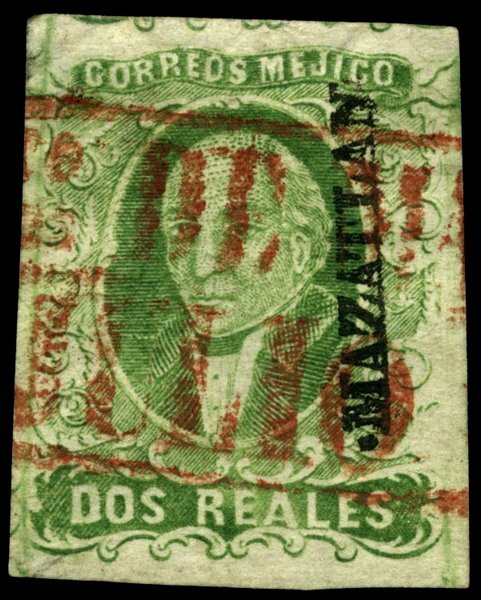 For Mexico, its first postage stamps were released on August 1856 with a series of five stamps valued in ½ real, 1, 2, 4 and 8 reals. These carried the same design of the patriot Miguel Hidalgo. 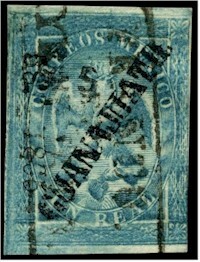 After their printing at Mexico City, they were distributed to the district post offices where they were overprinted with their names before being issued to the public. This process was an anti-theft measure as any non-overprinted stamps were considered stolen, hence, invalid. Soon, the “Eagle” stamps came out with an eagle wearing a crown. Still, the district overprints were issued in different variations and dates, allowing many variations to occur. These increased with the redesigned inscription of Mexico as Mejico. 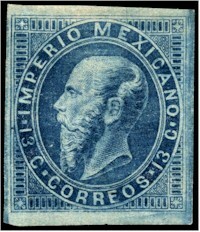 In 1866 new stamps featured a profile of Emperor Maximilian the First, and used the newly-introduced decimal currency that converted the Mexican Peso into 8 Reales that each equated 12.5 cents, rounded up to 13 cents. 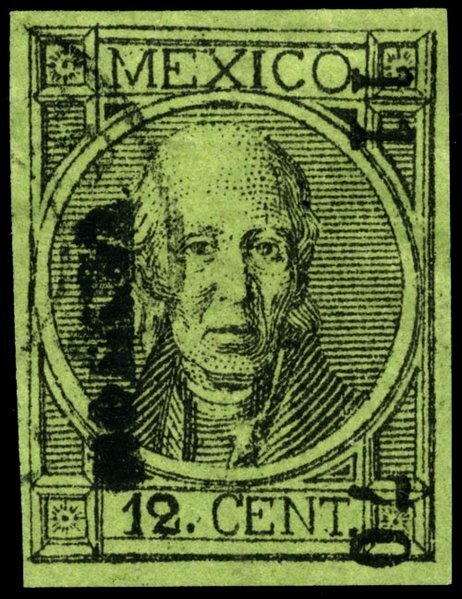 Emperor Maximilian was deposed in 1867 and the old Hidalgo stamps came back into use with the overprint of "Mexico". A year later, a new Hidalgo design was used on new lithographed stamps and many varieties have been observed.